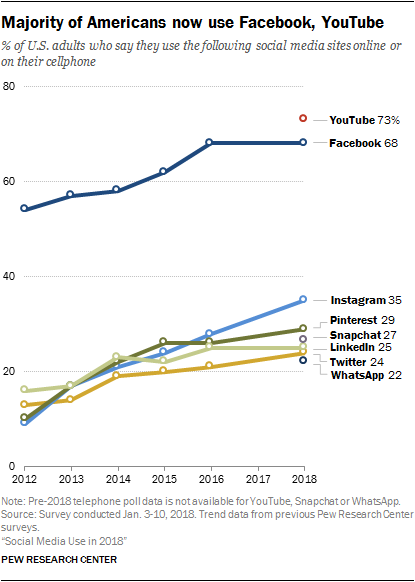 Facebook and YouTube remain the dominant channels, but younger adults are spending more time on Snapchat and Instagram. Americans are increasingly entrenched in and enchanted by social media platforms. New Pew Research Center statistics offer a snapshot of how U.S. users are spending their time online, including helpful demographic data for marketers looking to reach specific audiences. The survey found that 68 percent of U.S. adults still use Facebook, and 73 percent watch videos on YouTube. Smaller networks such as Instagram, LinkedIn and WhatsApp continue to rise in popularity. 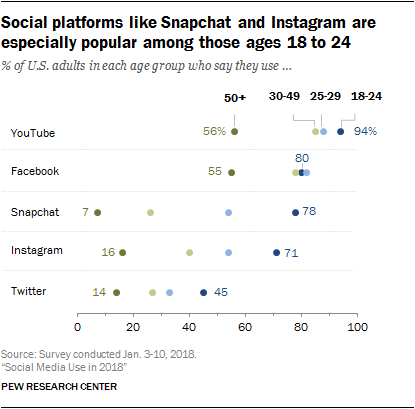 Instagram, the other preferred haunt for younger users, gained the most traction since Pew’s 2016 survey. Thirty-five percent of U.S. adults now use that channel. Pinterest remains substantially more popular with women (41 percent of whom say they use the site) than with men (16 percent). LinkedIn remains especially popular among college graduates and those in high-income households. Some 50 percent of Americans with a college degree use LinkedIn, compared with just 9 percent of those with a high school diploma or less. The messaging service WhatsApp is popular in Latin America, and this popularity extends to Latinos in the United States, as 49 percent of Hispanics report they are WhatsApp users. For more on Pew’s social media research, click here.